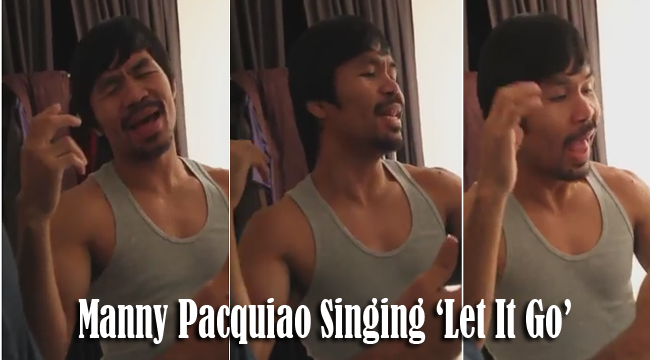 Manny Pacquiao, the Filipino World Boxing Champion, belted ‘Let It Go’ after seeing the Pacquiao parody done by Drake. The Manny Pacquiao Parody by Drake was posted last July 16, in the ESPN official YouTube account, garnering more than 600,000 views as of this date. Some Filipino Netizens appreciated Drake’s effort to copy Manny’s famous accent and down to earth personality. He even had the same style of hair, mustache,and beard. He wore a shirt showing support to Manny. They even made jokes on his voice, like using all the buttons in the recording room to fix his song, and Manny Pacquiao welcomed the video with good humor. At the end of the spoof, Drake (as Manny) even said he loves the Philippines and his family, still showing the boxer’s inspiration and character. In the exclusive video posted in Top Rank Boxing’s YouTube account trboxing, people would see Manny laughing at Drakes antics. He then made his own rendition of the song. As much as he tried to reach the notes, he laughed it out and still continued, having no care if he missed neither notes nor lyrics. He just did it for the sake of fun. Manny had been also known as singing patriotic songs in Tagalog and ballad songs in English songs. Though he knows he had not been graced with an angel’s voice, he is still proud to make people happy because of his actions. He welcomed jokes on him and have fun with it. Drake even posted on his Instagram account a short clip of Pacquiao singing the Disney’s famous song. Manny Pacquiao is set to fight and defend his WBO welterweight title Chris Algieri on November 22 in Macau, China where he defeated Brandon Rios on November 23,2013.